You may think your home is nice and clean, but is it really? You may be surprised to learn that even if you think your living area is spotless, there are likely lots of germs and dirt lurking around -- and sometimes where you least expect it. If you're wondering how clean is your home, there are a few places you should look. It's probably no surprise to you that dirt, dust and other undesirable things like to hide behind and under pieces of furniture. For instance, have you looked behind your fridge or oven lately? How about under your couches or even your rugs? 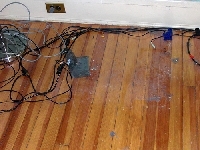 Dust bunnies and other household messes seem to make their way behind these areas. One of the easiest ways to give them the boot is to use a powerful vacuum with a long hose. Vacuums work wonders removing dust and hair and will likely take care of whatever you have hiding in these areas. Vacuums are also one of the most hygienic ways to get rid of dust and hair. Brooms and rags tend to simply move the hair and dust around and you typically never really get rid of it. Vacuums, on the other hand, remove the dirt, hair and dust and place it directly into the canister. Another hot spot for germs and dirt is under your rugs. Of course you likely clean on top of your rugs, but how often do you clean the underside of your rugs? Dirt and dust particles like to attach themselves to the undersides of rugs and when you place them on the floor, it becomes dirty again. Vacuum both sides of your rugs and your floors will stay nice and clean � likely as clean as you think. One place you may not think to look is in the tracks of your windows and doors. Mildew and other unsightly material like to take up residence there and their presence is often gross. Spray the interior tracks with all-purpose cleaner, then wipe them clean with rags. Spray the outside tracks with your hose and wipe them dry to prevent further mildew and bacteria from forming. Keep these spots clean can prevent mildew from getting inside and can keep your windows and doors opening and shutting smoothly. Ceiling fans are notorious for harboring large, thick layers of disgusting dirt and dust. You can even find mold growing up there. When you turn your fan on and the fan starts moving, pieces of that material can enter your air and land on your furniture and floors, complicating sinus infections and allergies. Go ahead and use your vacuum again to clean them, as long as your hose fits. If not, squirt the blades with all-purpose cleaner or a mixture of 2 tablespoons of white vinegar and water. Then place a pillow cloth over top a blade and pull it over the surface of the blade. The pillowcase will collect all the grime and keep it contained. Simply turn it inside out and dump it into your trashcan. They seem harmless, but salt and pepper shakers are full of nasty germs. In fact, they have one of the highest concentrations of cold and flu germs. So think again before you simply fill them back up when they are empty. Sanitize the shakers in the dishwasher and make sure you wipe the tops with wipes before you refill them. Not only will you lower your chances of getting sick, but your salt and pepper will likely tacit fresher. Now when you are asked how clean is your house, you can answer in confidence that is nice and tidy.